I read The Statistical Probability of Love at First Sight a few weeks ago and loved it. I wanted to check out other books by this author as well, so I found You Are Here. Ms. Smith seems to have plots and subject matter that hasn’t been thought of (or beaten to death) yet; that’s part of what makes her books interesting. Her stories aren’t huge, bloated episodes but small, thoughtful happenings that delve into a person’s or a family’s particular stories. The first dealt with randomness, really, and the effect that the unexpected can have on our lives. This book had more of a trajectory, about a girl who decides she needs to go on a road trip to see the grave of the twin brother she never knew she had. In this story, Emma Healy is the daughter of highly intelligent professorial parents. Her siblings are much older than she, so she basically grows up as an only child, surrounded by college students, intellectuals. The problem is that Emma always feels like she’s different than her family, not as incredibly smart or super focused on one area of study. Then one day, when she is getting something from the attic, she comes across the birth certificate of her brother, Thomas, who had died just two days after he was born. Emma has a neighbor, Patrick, who feels more comfortable with Emma’s parents than his own father. Mr. Finnegan is a policeman, and his beloved wife died giving birth to Patrick. Patrick and his father don’t relate very well, especially since the only thing they have in common has died. And they do not speak of her. Patrick has only once left his birthplace to visit New York City on a school trip, but his love of maps and other locales makes him yearn to travel. His father thinks otherwise, knowing that their town was loved by his wife, so it was good enough to never leave. Little does Emma know that not only will this journey help her to see her family in a new, more human, light, she will find new companions that will help her along the drive. And maybe she will end up helping them, too. So, Basically: I must mention that I started this book three times before I got into it. It could have just been timing, but I did end up liking the characters and the story. As I said before, I love the fact that this story is huge for the characters involved, but it is one that resonates on a personal level. The Bottom Line: I wouldn’t call this a “coming of age” novel, but it’s a nice, thoughtful story that feels true and real. 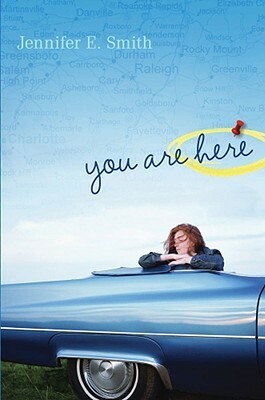 You Are Here by Jennifer E. Smith was published May 19, 2009 by Simon & Schuster Books for Young Readers. Ink and Page picked this book up from the library, so no one had a choice about whether it was reviewed. Thanks, Alice! I appreciate the comment. Have a great week!